Regardless of the type of cleaning or restoration you need, we strive to perform work that exceeds your expectations. We fully guarantee the quality of our work. If you are not satisfied at any point during the job, communicate your concerns to us and we will do our best to correct the problem. Our commitment to customer satisfaction is the main reason why we have an A+ Better Businesses Bureau rating. Each of our technicians is IICRC Certified, so you can trust us to get the job done right. Reach out to us today for a free quote or to set up an appointment. Give us a call at 727-657-8873 today. Your home or office carpets and floors require professional attention in order to stay pristine. Yet you should not let any old carpet cleaning service into your home or business to do the work. You should only do business with a respected and trusted carpet cleaner you feel comfortable with. This company should have years of experience servicing homes and businesses within your community. Look no further than Tampa Bay's own Elite Recovery Team. Our services are regularly lauded by past and present customers. Ask around and you will be hard pressed to find any sort of complaint about the quality of our work and our customer service. The Elite Recovery Team is the top choice for cleaning and restoration in the greater Tampa Bay area for good reason. We have performed thorough cleanings in homes, businesses and other commercial sites for decades. We go out of our way to maintain our reputation, improve our technology and implement the highest-quality cleaning solutions around. Our aim is to provide customers with deep cleans and thorough restorations that convince them to do business with us across posterity. Whether you need stains to be removed from your carpet, water to be extracted or restoration from fire / smoke damage, you can trust we will get the job done right on the first attempt. 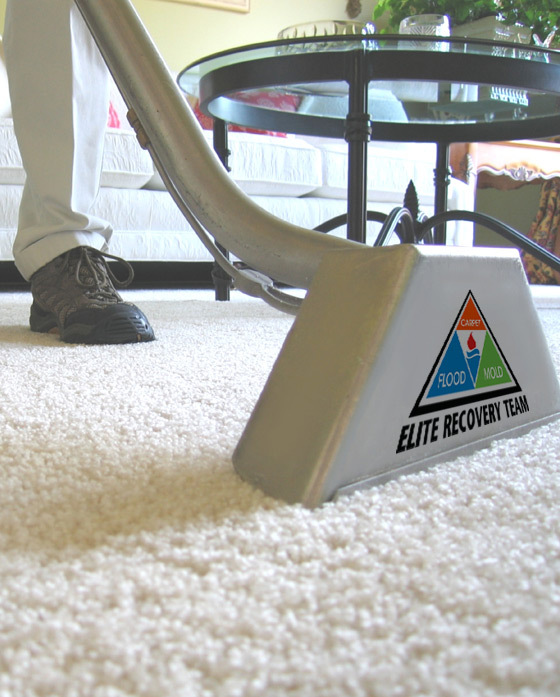 At Elite Recovery Team, we pride ourselves on providing the best service at the best rates. We true professionals and we treat you and your property with respect and appreciation. There are NO bad questions. We're here to provide the best services for you, so we want to make sure all of your questions are answered. Are you ready for impeccable service? Call us at (727) 657-8873 or use the contact form below to request pricing and scheduling information. 100% Satisfaction Guarantee. If you're not completely satisfied with any of our work, we will stay on the job until you are completely satisfied. We know how busy you are and how important your time is to you. We will be at your location at the time of your scheduled appointment. Your business and home carpeting, flooring, drapes and upholstery have a considerable replacement value. You want their functionality and aesthetics to remain high. Just like any other investment, these materials require careful, professional maintenance. Too many homeowners make the mistake of assuming that vacuuming the carpet will get it thoroughly clean. The highest rated vacuum cleaners gather merely a small percentage of all the grime, dust, dust mites, pet dander and allergens in a carpet. Once you consider the fact that tiny insects are living off of the dirt that your vacuum cleaner can’t collect. If your customers, clients or potential business partners see a nasty, odorous carpet when they walk into your establishment, they will think less of your business. Lean on the Elite Recovery Team’s commercial carpet maintenance program to provide an unparalleled clean that doesn’t break your budget. Carpets are inherently high-traffic spaces. People walk along this surface throughout the day and night, leaving all sorts of dust, dirt and allergens. The application of a carpet protector is exactly what your carpet needs to stay fresh and stand the test of time. Once it is applied to your carpet, even more dry contaminants will be loosened up for removal. As time progresses, every carpet absorbs odors. Whenever someone walks across the carpet, those odors are released into the air. This makes the entire home smell. Rely on Elite Recovery Team to implement high-tech carpet and upholstery cleaning methods that neutralize those unsavory odors from your home or business. Wow! This team is great. From the emergency work over the weekend to finishing the job, they were the best. Everyone who worked in our home was professional: always on time, cleaned up, and courteous. We could not have asked for anything more. Eric was great coordinating with our insurance company. Most importantly, great quality of work! Love our new bathroom. Great service, the team was focused on helping us find the issue and fixing it. Very helpful when working with our insurance to get the job done right - 100%. Called the company based on previous review. The work estimate and the actual work was done to our timeline. The actual work was superbly conducted in very professional manner. Would recommend to anyone. Thank you again especially to Robert and Eric! As an insurance agent we see water damage claims on a regular basis, the best part of Elite Recovery Team is I know that they'll give an honest and fair estimate to our clients whether it's a small job that will be under their deductible, or something more extensive. David and his team members are all top-notch professionals. They always arrived on time, they were respectful of my home and very pleasant to deal with. I would recommend Elite Recovery to anyone needing water damage restoration services. I'm a insurance adjuster and Dave and the pros at Elite Recovery Team are who I call in when my clients suffer water, smoke, fire, or mold damage. They have the years of experience, the right restoration equipment, and the integrity to always do a fair and honest job. We had Elite Recovery Team come out to our house to clean our carpets. I found their rates to be better than Stanley Steamer and they did an amazing job! We will continue to use them in the future and recommend them to our friends and family. Bring Your Tile Floor and Grout Back to Life!